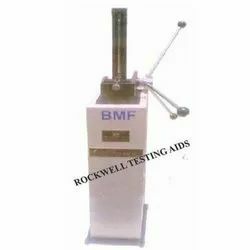 Offering you a complete choice of products which include anvils, standard test blocks, hardness test blocks, manual notch broaching machine and profile projector. 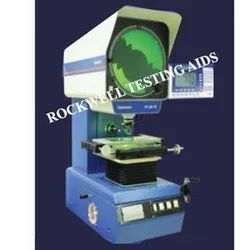 We are offering Flat & Vee Table for Hardness Testing Machines. 10. 100 mm diameter Flat Table. HRC 20-30, 35-55, 59-65 50 mm dia. HRB 80-100 50 mm dia. HRB 40-70 50 mm sq. HRA As applicable 50 mm dia. HB 2.5/187.5kgf 200-400, 50mm dia. HB 5/750 kgf 180-600 105mm dia. HV-5 & above 100-150, 180-220, 40mm dia. HV - 3, 100-150, 200-400, 40mm dia. HV - 1 100-150, 200-800, 40mm dia. HV - 300 gm 100-150, 200-800 40mm dia. 15N, 30N, 45N 50 mm dia. 15T, 30T, 45T 50 mm dia. HB 10/1000 90-120 HB 100 mm dia. HB 10/500 90-120 HB 100 mm dia. HB 5/500 90-120 HB 100 mm dia. HB 5/250 90-120 HB 100 mm dia. HB 2.5/62.5 90-120 HB 50 mm dia. HB 5/62.5 90-120 HB 100 mm dia. HB 2.5/31.25 90-120 HB 50 mm dia. HB 2.5/ 15.625 90-120 HB 50 mm dia. 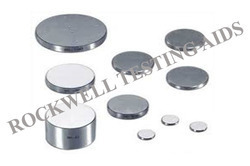 We are offering Hardness Test Blocks for testing as a spare of Hardness Testing Machines. 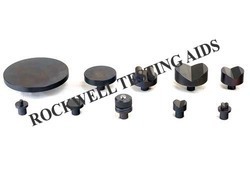 We have a wide range of all types of Hardness Test Blocks. Robustly constructed machine cuts the notches (V or U ) very accurately by means of specially designed multi- toothed broach, which is drawn across the specimen by self-push of rotating hand wheel. This machine is a cost effective solution for cutting Impact notches. Accurately cuts the desired notches as per respective standards in just a single pass within few seconds. A simple hand – vice for holding the specimen. 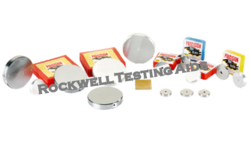 The tooling includes th e adjusters and end stops necessary to ensure notch-depth and position are correctly set. We offers a wide range of Profile Projectors to suit every need and budget. Optomech Profile Projectors come in three different types i.e., vertical projection table top and floor models, horizontal projection models. Standard models come with screen diameters from 200mm to 600mm. However Optomech has supplied projectors upto 1000 mm screen diameters against special requirements. All Projectors are supplied with high resolution, low distortion telecentric lenses. Magnification range from 5x to 100x. The X,Y measuring stages incorporate the unique screwless design with zero backlash and quick release facility. Optomech offers a choice of illumination systems i.e. collimated beam condensed light of fiber-optic cold light source. A variety of measuring systems from plain 2 axis DRO to 3 Axis microprocessor based geometric function DRO and advanced computerized measuring system with Graphical User Interface and capability to do reverse engineering.